Wear Spiral City's finest. The Limited Edition Black Hammer Series I pin set is straight from the pages of Jeff Lemire and Dean Ormston's Black Hammer, published by Dark Horse Entertainment. 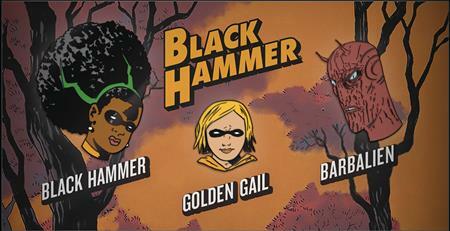 These officially licensed soft enamel pins measure about 1 3/8' tall (Black Hammer), 1' (Barbalien) and 3/4' (Golden Gail). Each pin is based on Dean's stunning artwork and the three-piece set comes packaged on a custom backboard also featuring his art.